Sindh Track and Field Club is a private athletic club devoted to training young athletes in Urban as well as Rural Sindh. The club was founded by three coaches, two years ago and today boasts over 40 members. The team at Sindh Track and Field creates customized training program for young athletes based on their fitness level and designated events and over the last two years has produced and trained a number of remarkable athletes. 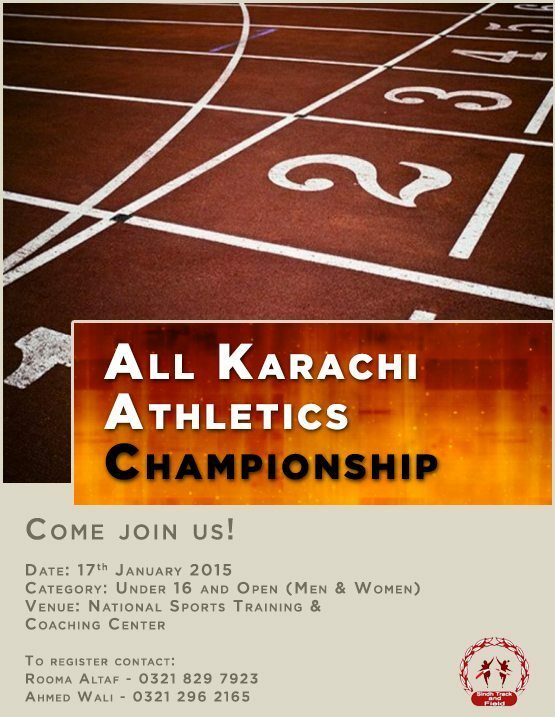 Our upcoming meet scheduled for 17th January 2015 at the National Sport Training and Coaching Center in Karachi. If you are interested in sponsoring a Sindh Track and Field event or team, discuss CSR activities or even enroll your children into our customized training programs, drop us a note at sindhtrackandfield@gmail.com. Or walk into our evening training session on the right hand side of the track at NCC in the evening starting Monday – Saturday from 4:30 pm – 6:30 pm. Just follow the 8, 9 and 10 years old who appear to be emulating Usain Bolt, Krani James and David Rushida. Next Next post: Rainbows and Richter scales. My father’s brothers.